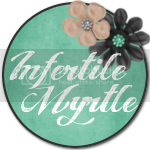 The Infertility Overachievers: 17 weeks! Mike left for his deployment a while back. I know its only for a short time but I just HATE not being able to talk to him everyday. There is so much going on here that I feel like he is missing out on. I have so much more respect for these wives who do 15 month deployments now. I just can not imagine it. I went on a trip down to Savannah. I had a BLAST, however I was very ready to come home. When I am there, I am on the move ALL DAY. I still need daily naps or I am a CRANKY CRANKY gal :) But it was really nice to be able to stay for as long as I did. Baby London has started moving in there. It's nothing substantial yet, no obvious kicks or punches but I can definitely feel it when he changes positions. It feels like little flutters. Every time he moves, it surprises me. It's a very weird feeling. I can't wait for him to get stronger, so that we can feel his movements on the outside of my stomach. However, I know I still have a few more weeks before that will happen. I'm just so excited and hope that Mike can feel him when he gets home. My dog Leia learned how to jump our 6ft privacy fence. She is not that big, she only comes up to my knee and weighs about 45 lbs. I just don't understand how the heck that dog does it So I had a handy man come out and put a electric fence up and that seems to have stopped her (FOR NOW!). 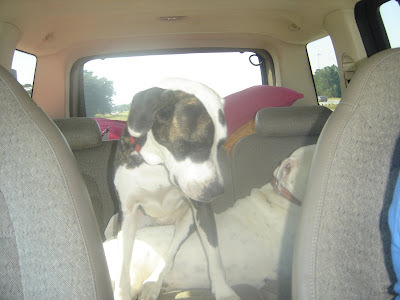 Picture of her just for fun.....Oh and yes, she is sitting on top of our other dog Daisy. That is her favorite way to ride when she is in the car HAHAHA! Hummmm....what else. Oh I went to the Dr last week and London is measuring a full week ahead. 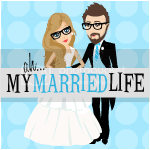 Normally they would change your due date and all that jazz, but since we did IVF and KNOW the exact moment of conception, they are leaving it alone. I have this total fear that he is going to be as big as I was at birth. 10 lbs 9oz. EEEEKKK!! My mother is a saint because there is NO WAY, I'm pushing a baby that big out. (And I wasn't even her biggest, my brothers weighed 11 and 12 lbs). From what his mom says, Mike only weighed about 5 lbs. She is a tiny woman though, so I figured he wasn't very big. Maybe London will average between mine and Mike's birth weights and come out a nice 8 lbs-er. HAHAHA. I still have plenty of time to worry about birth weight over the next few months. Random fact: I am ALMOST half way done with this pregnancy. PHEW!!!!!!!!! 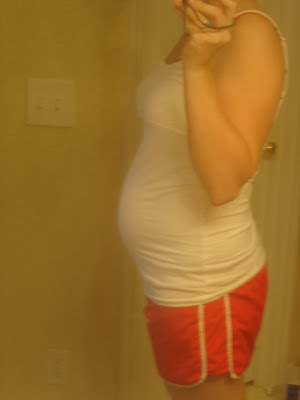 Lastly, for those of you who care, here is a belly pic of me at 17 weeks. You look great! I hope your dogs are ready to forever have the back seat! pregnancy suits you:) you look soo cute! what a great size bump! You look so cute!! So exciting that you can feel him move! Adorable little baby bump you have there at 17 weeks!!!! That is super exciting that you're getting the flutters! I looove feeling the baby, it is such an amazing feeling and bond that only you and baby have and not to mention a great reasurance that there is in fact a healthy baby in there!!! Don't worry about measuing a week ahead, that will change back and forth a few times as mine and all my friends have as well. They usually don't change the date unless it is two weeks off the original date, so I'm sure your golden! I'll keep my fingers crossed for that 8 pounder!!! 12 pounds boggles my mind completly!!! What a cute baby bump you have going! That is so exciting that you are feeling him move! One of my dogs jumped our 6ft privacy fence, twice. She was able to jump straight up, cling on to the side and push herself over. The first time it was for her beloved squeaky ball and the 2nd time was b/c of a squirrel - ahh!! I'm so glad you posted, I was wondering if things were ok! I can't believe I'm 33 weeks now - not much longer! I've only gained 20 pounds so far - but I had some "fluff" already. :) I'm still exercising and feeling really good. The 2nd half has been MUCH easier! Keep posting!